Serena Williams once said, “No one likes getting their nails done more than I do.” Plenty of women the world over share this sentiment. 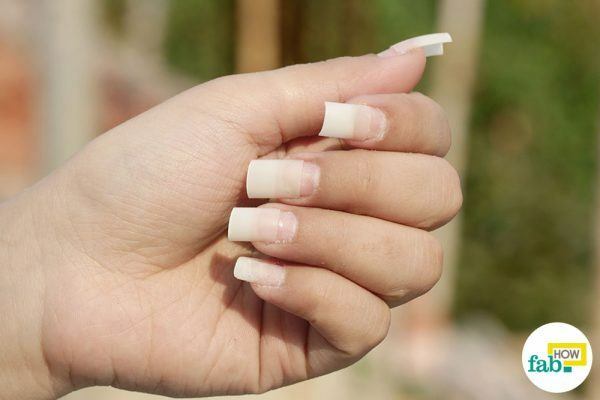 Fashionable nails have been all the rage lately. Gone are the days when a popping shade of nail polish was the only accessory to jazz up your nails. Nowadays, people are going big, and nail extensions are becoming exceedingly popular. Acrylic nails are a type of artificial nail extensions applied on top of your natural nails. If done correctly they are durable, sturdy and offer protection for brittle, broken and damaged nails. 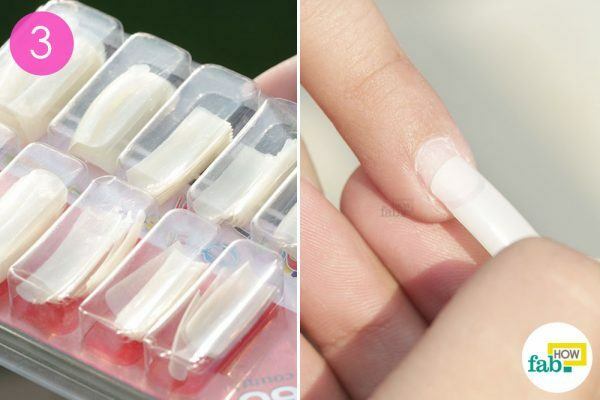 So if you're one of those girls with weak nails that break or split easily, then acrylic nails might be for you! Besides these practical benefits, acrylic nails are stunning. They embellish the hands, make the fingers appear longer and give them a gorgeous appearance. Most often they are sold in a long length but can be trimmed and shaped according to your preference. Acrylic nail supplies are available at many drugstores, beauty supply stores and online. With the right shade of nail polish, a little nail art, and a few hand accessories, acrylic nails accentuate not just your hands but also your overall appearance. Going to the salon to get your acrylic nails done is an option, albeit a costly and time-consuming one. You can save your time and money as well as get creative and experiment with different designs by applying acrylic nails on your own in the comfort of your home. 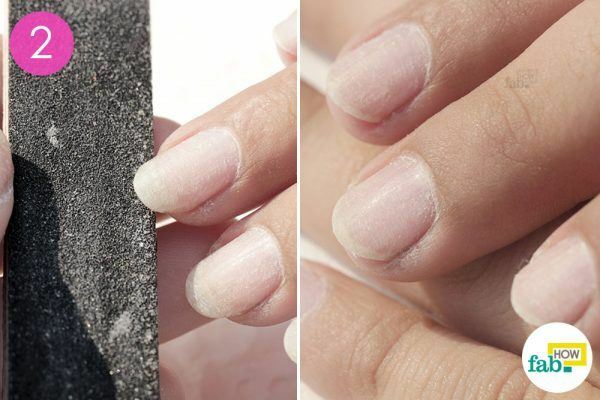 Start by removing any nail polish you are wearing on your natural nails using a nail file or nail polish remover. Trim your natural nails to a comfortable length using a nail clipper. Make sure you do not cut them too short. Next, file your nails and even out the erratic free edges at the tips. Using the same file swipe the surface of your nails using gentle strokes. 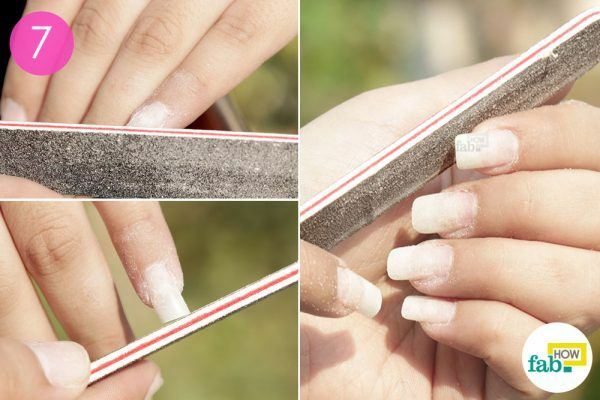 Doing this will help rid the natural nails of their shine, allowing the acrylic nails to stick to them more easily. Make sure your strokes are even and light, as an aggressive, abrasive action against the natural nails can damage them. Focus more on buffing the cuticle area. Alternatively, you can use a four-sided buffer block instead of a file. Choose a nail tip from your acrylic nail set that matches the width and shape of your natural nails. Your acrylic nails may have a translucent marking on the lower end of the inverted side of the nail. The correct way of applying the acrylic nail is by placing the marking point at the beginning of your natural nail. When the marking point meets the tip of your natural nail, the acrylic nail will adjust itself onto your natural nail accordingly. 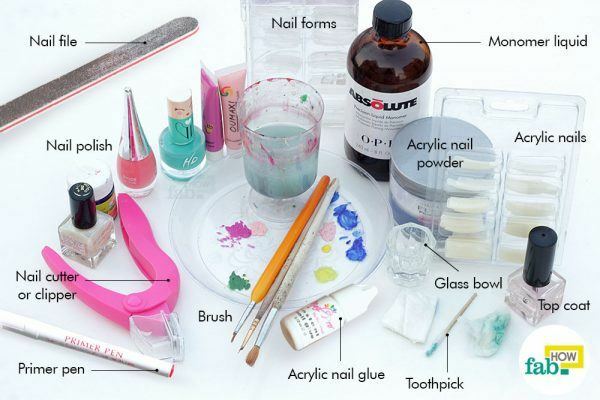 Apply glue on the bottom area of the acrylic nail. 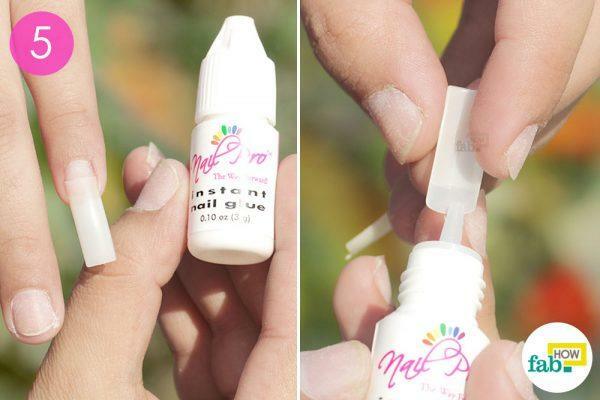 Use the clear marking point on the inverted side of the nail tip as a guide for applying the glue. One drop is sufficient for each nail. 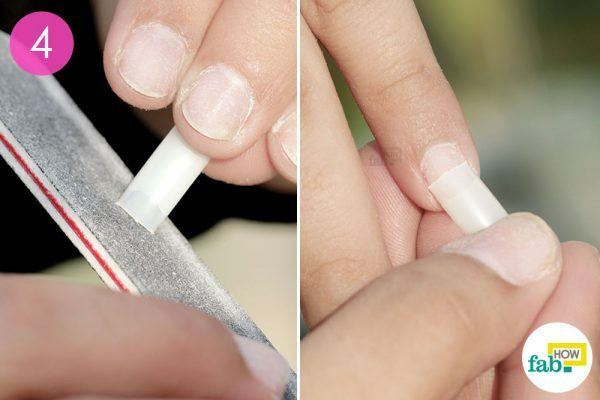 Once you have placed the glue, adhere the acrylic nail immediately to prevent the adhesive from drying. Next, hold the acrylic nail with the index finger and thumb of your other hand, and apply gentle pressure for 10 seconds on the area where the acrylic nail extends beyond your natural nail. Doing this will help the nail stay firmly in place while the glue is still wet, and allow it to adhere quickly. Make sure you do not touch the area where your acrylic nail meets your natural nail to prevent your fingers from getting sticky and moving the still-wet nail out of place. Repeat these steps until you have done all ten nails. Next, carefully cut the acrylic nails with a nail cutter according to your preferred size and shape. A nail cutter is strongly recommended for this step, however, in a pinch, you can use a set small household nail clippers. At this point, the acrylic nail will appear slightly raised. The position where the artificial nail ends and the natural nail begins will be quite conspicuous, and the transition will be evident. To reduce the appearance of the ridge, you can file the base of the acrylic tip to bring it to the level of your natural nail. However, while you are filing, you must be extremely careful not to hit the natural nail itself. Doing so can cause damage to your nail bed. Once filed the acrylic nail merges with the natural nail and the transition is much less apparent. One other option is to take a paper towel with acetone-based polish remover and wipe over the ridge several times. Doing this will help merge the two areas. Next, file the tip of your acrylic nail to eliminate any uneven edges. Repeat the process on all the acrylic nails. This picture shows what they should look like after you have finished filing. What is the base coat for ? The reason of putting base coat is it keeps artificial nails from staining, and keeps polish on nails longer. It gives acrylic nails a good start. Hope this helps. I want to learn how to do nails…..how do I start? Hi, i was wondering do they sell these in kits and were could i get them? Try ebay I’ve found a lot of cheap sets there.. free shipping too! So we shouldn’t use an untifungl drops befor applying the acrylic gel ? Hey could I have this info sent to my email please? i would like to learn how to do nice nails i do my own nails but i don’t use gel polish that much.due to the fact i don’t have a nail dryer.i would love to do false nails for family and friends.i was wondering if you could help me.i was told that my nails were hard so what can i do about that and i would like to know how to keep false nails on and make them look nice.